The American Kennel Club® (AKC®) expanded its litter of registered breeds on January 1 to welcome the Treeing Walker Coonhound, growing AKC’s family to 174 breeds. The Treeing Walker Coonhound was bred originally — like the other five AKC recognized coonhounds (American English Coonhound, Black and Tan Coonhound, Plott, Bluetick Coonhound and Redbone Coonhound) to help put food on the table. See coonhounds recognized prior to 2012 on the AKC/Eukanuba National Championship which will be telecast on ABC Network Television on Saturday, February 4, 2012. Check local listings for airtimes. Today the Treeing Walker is known as a fast and sensible hunter with superb endurance. The breed’s coat is short, glossy and tri-colored – white, black and tan and requires minimal upkeep. Intelligent, confident and sociable with family and friends the Treeing Walker thrives with regular exercise. Be warned though, coonhounds are bred to be heard so if you are considering adding the breed to your household, be prepared for a voice loud enough to carry for miles through the woods. For more information about this breed, visit the www.akc.org. To become an AKC recognized breed there needs to be a certain number of dogs geographically distributed throughout the U.S. and an established breed club to watch over them. Breeds waiting to gain full recognition are recorded in AKC’s Foundation Stock Service® (FSS®). More information on the process can be found at the AKC’s Web site. 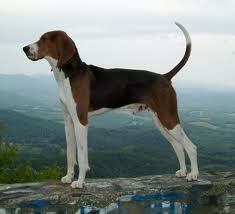 I found a lost or abandoned Treeing Walker Coonhound never to find the owners. I fostered him while he was placed for adoption through Operation Pets Alive. I can tell you from experience, they are great dogs. Clyde is very good with my 7 year old daughter and my 5 other dogs. He is always concerned for the family, calm, athletic, and an all around easy dog to care for. He is hound so I find a Halty or nose harness is the best way to control him on walks. He can run VERY fast and owner beware, he has a great hound voice. Clyde has now found his forever home at Inwood Crossing, an Alzheimer and Dementia Home in Tomball, TX. He fits in perfectly, gentle and agile around the residents, a nice size so they don’t have to bend over to pet him, and his head can rest right in their lap for long loving pats. I am so proud of him and he is loved by many now. I miss you my big Clyde!